Published on 17 August 2008. After quite a journey together, we’ve arrived at week seven of the Summer Books series. I hope, dear reader, that you’ll think us close enough by now to share some guilty secrets. If not, then who can blame you? After all, the largely monological way in which I’m bestowing my opinions upon you can hardly breed intimacy, but I’m afraid the boil of this review needs to be lanced at some point, and now seems as good a time as any. 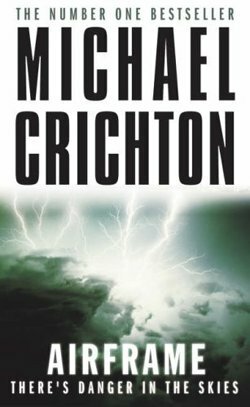 You see, the thing is, I’ve never read a Michael Crichton. Jurassic Park, Prey, The Terminal Man, Next Sphere, these are all just names to me, or in the case of the first, a blockbuster movie. I’ve never read the original text of any of them, and nor I am sure I have the desire to do so. However, with Michael Crichton described as one of the greatest and most thoroughly researched writers of our time, I thought I should step into the breach, and given my love for trashy TV programmes like Air Crash Investigation, I thought that Airframe would be the perfect vehicle for my exploration of these new lands. And so I casually segue into another bombshell of a guilty secret: I hated it. I found it one of the single most dull books I have ever battled through. Airframe is advertised as a thriller. Try as I might, there were only about three short passage during which I could – at even the most generous push of my imaginations – be described as even vaguely interested, let alone thrilled; and those passages played only the most minor of roles in the plot as a whole. The story, such as it was, really described nothing more than a particularly stressful week in the life of a dull woman who works for an aircraft company, combining well-rehearsed plot devices about a woman in a male-dominated work environment with well-rehearsed plot devices describing the conflicted life of a journalist. Frankly, the this novel would be no less of a page turner if it were served encased in a jar of golden syrup. All of which is not to say that the book is particularly bad, per sé: It’s just bland. Much like magnolia paint, it’s dull but inoffensive, nobody’s favourite, but disliked very few. I am afraid I am one of the few. When I read, I like to be interested, challenged, even moved – Airframe does none of that. Yet if you like your books bland, you’ll probably get on very well with Airframe: Just don’t expect me to agree. This review was originally posted here on sjhoward.co.uk in March 2005, and has been extensively re-versioned for the ‘Summer Books’ series of reviews published on sjhoward.co.uk and Gazette Live. This 1,366th post was filed under: Summer Books, Books, Gazette Columns, Michael Crichton, The Guardian.